Though my love for the sandwich cookie remains, my tolerance for its artificial ingredients does not. Luckily, it only takes a little elbow grease — OK, and a fair amount of butter — to whip up a delicious batch from scratch. Make sure to have a big glass of milk on hand for when these come out of the oven. In a large bowl, combine the flour, cocoa, baking soda, baking powder, salt and sugar. Use an electric mixer on low speed to mix in the butter, then the egg. Continue mixing for several minutes, until the dough comes together in a mass. Take rounded teaspoons of the cookie batter and roll into balls. Place about 2 inches apart on a parchment-paper-lined baking sheet, then use your hands to flatten the balls into even patties about 1/4-inch thick. Bake for 9 minutes, rotating once for even baking. Set baking sheets on racks to cool. To make the cream filling, beat the butter at low speed. Gradually beat in the sugar and vanilla. Turn mixer on high and beat for 2 to 3 minutes more until the filling is slightly fluffy. If the butter gets too warm, the mixture might start to look runny; if that happens, just chill it in the fridge for a few minutes. To assemble the cookies, load the cream filling into a pastry bag. (If you don't have a pastry bag, use a Ziploc bag: Fill the bag with the cream filling, seal it and use scissors to cut off one corner of the bag.) Pipe teaspoon-size blobs onto the center of one cookie. 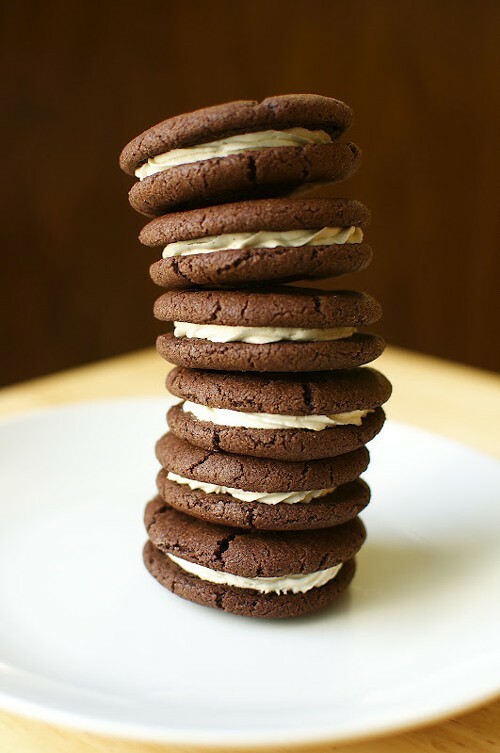 Place another cookie of equal size on top of the cream and lightly press together. Repeat these steps until all the cookies have been sandwiched.